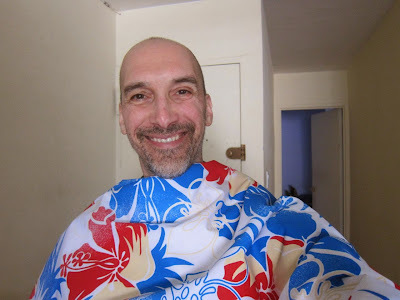 male pattern boldness: Repairing My Parka + What Would YOU Make With This Fabric? Repairing My Parka + What Would YOU Make With This Fabric? 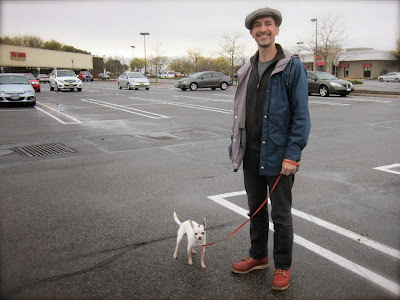 My mountain parka (above) is one of my all-time favorite sewing projects. I made it last September and have worn it constantly through fall, winter, and now the spring. 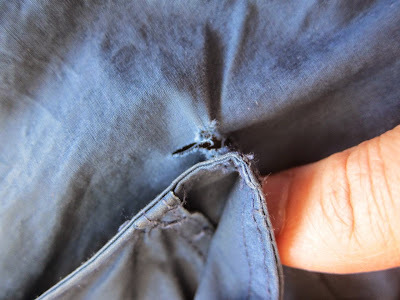 So I was less than thrilled when, tugging on the right lower pocket with my hand inserted awkwardly while sitting down, I ripped the top outer corner of the pocket right off the main fabric. Eek! This parka would have been sturdier in a heavier fabric but, then, what garment wouldn't be? Fortunately, I still had some of the blue coated cotton in my scrap stash, so I was able to make a matching patch. What contributed to the weakness of the fabric in this spot was that I over-stitched the corner (see thick bar tack below). 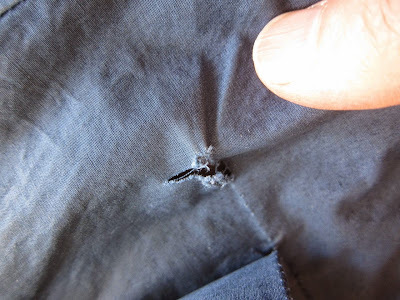 It's easy to forget that stitching can weaken fabric as well as reinforce it. In retrospect, I should have added some kind of interfacing to the wrong side of the fabric. 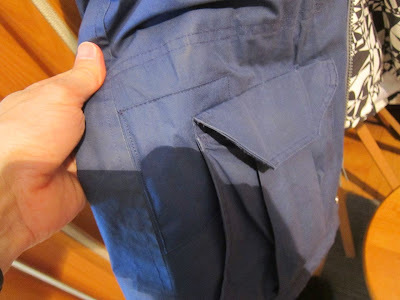 Since I could see that the left pocket was also vulnerable to the same type of tear, I removed the upper corner of the pocket and made an identical patch. As you can see below, the patches are hardly noticeable, plus my arms hang over them. Patch placement prior to stitching. Yet another reason why it's good to save some scraps from important projects! In other news, I was fabric shopping yesterday and, somewhat impulsively, picked up a wild print that has had me second-guessing myself ever since. Has this ever happened to you? 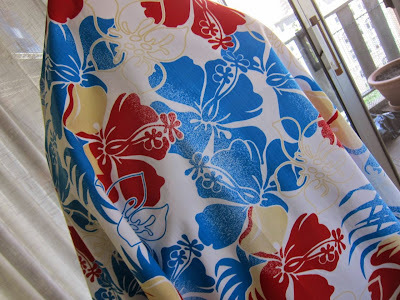 It's sturdy coated cotton in a tropical print and I'm not sure what I'm going to do with it. 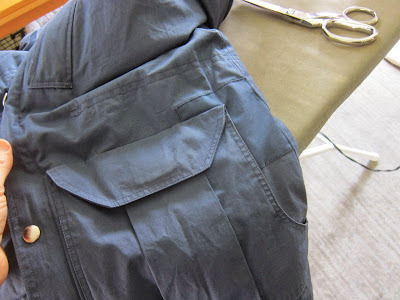 It's way too heavy for shirting and too coated-feeling for pants; it really would work best as outerwear. Or as a shower curtain. Michael does not want to be seen in this fabric. The spray-painted look of the blue hibiscus is intentional. Seriously, it's not an unflattering palette, but the scale of those flowers...I don't know. In closing, assuming you had to make something with (two very wide yards of) said fabric, what would you make? Bike panniers! Perfect fabric for it. Ditto! No one will miss you with that. I second the beach umbrella idea. Yup, beach umbrella was the first thing I thought of too! I agree. Beach umbrella with matching beach accessories if there’s enough fabric left. Glad you were able to mend the parka! I make cloth napkins with 2yd swatches. Table cloth and chair cushions. Outdoor use. loving your bright hawaiian style print, perfect for sunny summer shine! Aprons. Hanukkah gifts for all. I think it wants to be the lining on a winter coat or cape... mostly hidden but secretly cheering you up on a cold and grey day. line a picnic basket, with matching napkins and beach/quilt. With my son's pants I've made or repaired I incorporate the patch or reinforcing stitches into a funky design or fabric treatment. For example, he forgot he was wearing dropcrotch pants and impaled himself on a citibike seat. I knew I couldn't match the fabric so I just made a leopard print crotch....he loves them!!! Board shorts and matching beach tote. A short raincoat with very simple lines with the top stitching that you do so well. Maybe a beach hat out of the scraps. I vote with those suggesting home dec. how about a tablecloth and matching napkins? Very summer. A beach umbrella and matching beach bag. You can buy umbrella frames and enjoy the mathematical puzzle involved in covering them! I see lots of beach ideas, but this print screams Beach Swim trunks with matching hat! I am agreeing with you. I can't remember if the parka was lined or not? Anyways, it doesn't really matter. What we were taught to do with patch pocket corneres in tailoring course - reinforce them with bias cut small patches on the left side. 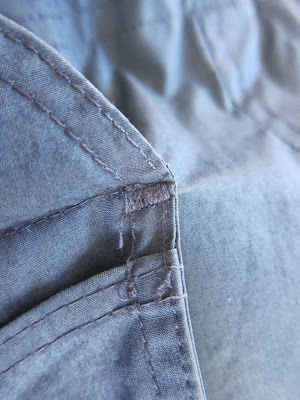 I usually tack them in place before I topstitch the pocket to place. I've noticed that RTW has turned that reinforcement into a design detail. 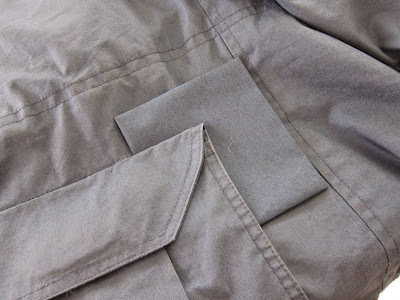 There's a rectangel topstiched under the patch pocket opening or as you did two square s under each corner. I was thinking of a beach umbrella too! Or a shower curtain. 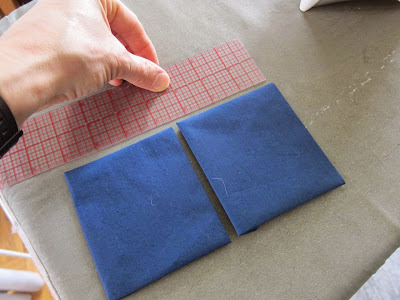 It's standard to reinforce the entire top of where patch pockets will sit, from the inside with either a strip of linen (high-quality old way) or a strong woven fusible that is stitched into when the pocket is attached. Great repair job. Interesting fabric. 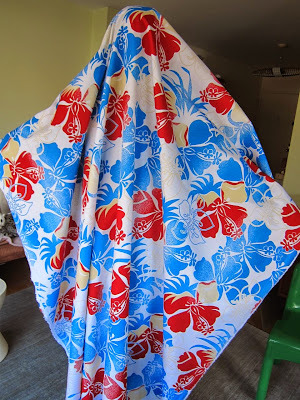 Just had a fabric bobo on Ebay, I failed to look at the scale and it has an enormous print. daughter and friend think it is hideous, so I'm keen to see the outcome. If interested my print it here http://www.ebay.co.uk/itm/Retro-Renaissance-Spun-Viscose-Print-Dress-Fabric-Material-Multicoloured-/231526671410? Check out 2NE1's Falling in Love music video-the women are wearing large scale prints in some scenes. The fabric print could work for pants or a maxi dress or skirt! Or short dresses. Vintage surf set (shorts and shirt) would be cool. A bombshell dress for Cathy with a mtaching beachbag and parasol. Very 60's. In trying to make better stitched garments than RTW it's so easy to forget stresses seams should nevertheless not be stronger than the fabric (to avoid tears in the fabric). I make the same mistake too. Glad that you were able to patch this one up successfully. As for the print, not being a Master of Prints like some, I'd probably use it in smaller chunks as focal points in multiple project. I do also like other's idea of an umbrella! Floor cushions or a tent! Luggage or a courrier bag. Easy to find on the baggage carousel. Picnic set: blanket, line a basket...maybe a bit for a bucket hat. Something about it must have spoken to you when you first saw it? I don't think I could even stand it as a shower curtain. That print needs to be outdoors. I think you should line a hostess skirt like Lucy Ricardo or Lana Turner in Imitation of Life. It looks like something Edith Head would use for lining. I think you would really rock a hostess skirt over pants!!!!! I think Cathy needs a bombshell dress. If that fabric is too stiff for that then what about cushions? I love outdoor cushions personally and seem to make a couple of new ones every year. Interestingly, I could actually see that fabric as a fun summer sport coat. Fabulous fix on the jacket, BTW. Vogue Spring Fashions -- of 1942! New Pattern, New Fabric, New DECLUTTERING! The Western (or Cowboy) Shirt -- YEA or NAY? Yee-Haw -- Peter Models the Western Shirt! Vogue 8889 Men's Shirt Reveal or "Hello Voile-y"